Trail cameras or best known as game cameras consists of a small, camouflaged and waterproof box with lens. The mechanism of this product starts by placing it in a remote location by strapping it to a tree, and set to record it when there is motion. Then, you can come back and review those photos later or you could command it to send pictures to your phone automatically. Apart from that, these devices are more advanced in technology than normal digital cameras as they have many more added features such as motion detection, night vision and timed recording. Being self-powered and operated, they are able to work day and night. During the day, it uses the natural day brightness to sense movement, whereas at night, it uses flash and infrared to improve its night vision pictures. The various purposes of trail cameras are for security surveillance, cellular trail and wildlife camera to check on and take picture of animals and finally livestock surveillance to prevent theft. Hence, check out this review to make your best cellular game camera choice. Side note: It would be better if you are able to navigate your way through the thick marsh by using a GPS. Here is five recommended products decided by certain factors. The trigger speed is rated from low to high. Clarity defines how clear a picture is. The higher the clarity, the more clear and high resolved the pictured that is captured, be it captured during day or night. A good quality device has a high clarity as a feature so you should look for a game camera with high clarity. The game camera sends the pictures captured to your phone or email or you can manually remove the SD card and view the contents in your computer. However, you should set the right sim card and SD card into the game camera as most of them will not operate without the right sim card with connection. You should also register your product on the website or app to easily give it commands. The trigger speed is the time taken for the cellular trail camera to detect a fast-moving motion and capture its picture instantaneously. It has to be accurate in capturing the picture at the right moment and quick so you can be alerted of any situation on short notice. The battery life on the other hand is the time taken for a fully charged battery to last. That being said, they are usually left strapped on a tree for a few days to capture picture of its surroundings. Hence, you should choose a product with a long battery life so you don’t have to frequently change them and it can last for a long time. This game camera consists of a wireless MMS camera that uses an activated sim from AT&T to text photos and videos to your cell phone or email address so you don’t have to remove the SD card and transfer the contents in your phone. The setup is easy where you just need to download the app on your mobile or access it through the website and created your own online account. However, getting the right sim cards in for it to work is the tricky part. But fortunately, the AT&T sim card is provided with the purchase of this product. The day pictures are clear with high resolution and the date, time, temperature and moon phase are printed on a thin stripe at the bottom of each photo. The night pictures on the other hand is a little grainy but serves its purpose. The trigger speed is good as the pictures captured are sent quickly to the phone via text message. Moreover, you can also send commands your phone directly to the camera as it has a cellular connection. In terms of safety in case someone wants to steal your device, you can send a text code to your product and it will send you the exact location of itself with accurate latitude and longitude. Therefore, you can easily retrieve your stolen camera. Furthermore, this product uses 12 AA batteries to operate, though they last for a long period of time, approximately 2 months. Also, you can opt to use lithium ion batteries so more photos can be captured or even solar batteries. However, if you use solar batteries, you should place the device in a place that is exposed to the sun for it to work efficiently. This product does not take photos efficiently when it is raining hence not being waterproof. Therefore, you are advised to put a gasket sealant on it to prevent water flowing into the trail camera thus ensuring that it is long lasting and durable. Covert’s game camera sometimes also power off by itself, so closely monitor it whenever you can. If you have any problems in setting it up, contact customer service for further guidance or you could format the SD card again, and the camera will function normally again. 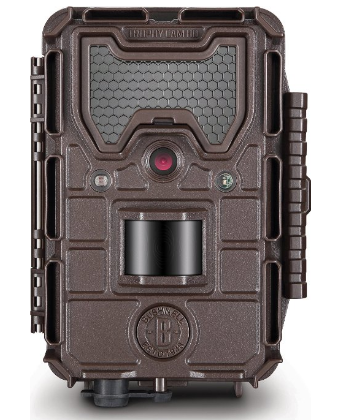 The Moultrie’s trail camera is 8 megapixels and has an infrared panoramic feature. It comes with 3 motion sensors that contributes to a wider detection range so you can take pictures in 3 different zones which are left, middle and right. Pictures also can be captured from multiple angles. Moreover, this product has 5 operational modes which are the IR triggered game, time lapse plot and plot camera by day and motion camera by night and finally the HD video day and night mode. The setup is easy provided you are aware of the SD and sim card needed. This device is compatible with the Eye-Fi connect X2/Pro X2 wifi memory card which allows it to transmit images to a wifi network and internet. Without the wifi SD card, this game camera will not operate as it needs to be loaded with some type of removable storage. If you have any problems with the setting, you are advised to replace your SD card or reformat it in your computer. The battery life is said to be fairly low as in 35 days or a month approximately in which it requires 6 cell alkaline batteries, however these batteries drain fast so you should consider purchasing solar batteries to avoid replacing your battery frequently. Equipped with a motion detect delay feature, this product will be in a sleep state for some time thus extending its battery life. Also, the time lapse function works on 2 windows only which are early morning and early afternoon, thus having no 24 hour time lapse. The picture of this trail camera is of good clarity be it day or night. The night vision is also excellent as the pictures produced during the nights are clear with high resolution. Being weather-proof, this recording device also has a brilliant trigger speed in detecting a motion and capturing the picture itself. Included with this product is a multi-shot mode feature which takes multiple shots of picture per trigger. However, the panoramic seams sometimes overlap thus eliminating small parts of the photos but still produces clear video and pictures at night. Hence, in my opinion the clarity of picture is more important than its seamless panoramic feature. From the name of the game camera itself, it is stated that it has a no glow black LED night vision flash, hence it makes a good camouflage as it is unnoticeable when taking a picture and during surveillance. Having a 0.2 second trigger speed, it is very alert and capture pictures almost instantly when a motion is detected. Other than trigger speed, Bushnell’s trail camera has a excellent trigger reset speed so it takes photos repeatedly in a short period of time. Furthermore, this trail camera comes with 14MP high resolution images and HD videos with audio record. Therefore, you can take good quality pictures and videos with larger output size, hence displaying all the intricate details of the surroundings in the picture captured. Holding up to a 32GB SD card, this product has a lot of storage space to capture more pictures and videos for a long period of time. The battery life is also fairly good as it does not drain quickly and can last to approximately one year so you do not have to frequently change them. Being waterproof, this product can survive and function well during rainy weathers so you need not worry about the damage of this product. Besides that, during a windy day you can reduce the trigger sensitivity and eliminate the wind activated photos. The setup is easy if you are used to all the different type of settings. There are a lot of settings to adjust, so be careful and adjust them one at a time according to your own preference. Pictures captured can be viewed by removing the SD card and connecting it to your PC to save and transfer the pictures. Also, the pictures have high quality and clarity, and every picture is embedded with the moon phase, temperature, date and time. If you are experiencing problems with the game camera system such as it shutting down by itself, you are advised to reformat the SD card and monitor the trail camera frequently. Moreover, the pictures captured during the night are a bit grainy sometimes but still serves its purpose, so you need to carefully check and adjust your settings with the LED thus setting it to the right mode. Consisting of a nice and petite unit, Browning’s cellular trail camera is lightweight hence allowing hunters to easily carry more than one of it into the woods in a small pack. The pictures captured by this trail camera are of good quality whether taken day or night it has a good clarity followed by high resolution pictures and videos. This product includes a watch-timelapse viewer software hence enabling you to take a timelapse of the surroundings from day to night. To do this, you can set the timer every 30 minutes or an hour for instance to create a timelapse. Moreover, the strapping of this wireless game camera on trees are easy because the straps provided are long and easy to fit on large diameter trees. However, you are advised to choose a strategic location to strap the product on. Hence, you should not set it near branches or any objects that can be moved easily by the wind. This can prevent unnecessary photos being captured due to it detecting its quick motion because most game cameras are sensitive to motion. This product has a fast trigger speed hence records any fast-moving objects into its SD card. Each photo captured are recorded with the time, temperature, date and moon phase. Not only that, this product is also weather-proof thus being durable and long lasting especially during the monsoon season. Equipped with 6 AA batteries, the battery life of this wireless trail camera is also excellent and long lasting so you don’t have to frequently change them hence saving cost. The setup is easy for experienced hunters as the programming is simple. However, beginners should read the manual provided carefully to understand the mechanism of this trail camera. On the other hand, SD card is hard to be removed so you are advised to use tweezers to assist you in removing it easily without damaging it. The latch on the camera is made out of plastic so you should be careful when handling the game camera. Lastly, it is very realistic looking on the tree so it camouflages easily with the tree. The compact size of it also makes it impossible to be recognized at first sight. Equipped with a no glow high output covert infrared night vision feature, this game camera does not emit a dim red glow like other trail cameras thus making it invisible to the naked eye especially at nights. Moreover, this product has a rugged weatherproof enclosure hence making it durable and still working well after going through a downpour. It also has a rubber insert to help with the weather-tight seal to prevent water from leaking in the interior thus damaging it. In terms of safety, you need not worry as you can lock this cellular trail camera on trees with the Master Phython cable locks. Being covert also makes it unnoticeable to animals and intruders. Besides that, this product includes an adjustable bungee cord for mounting purposes so you can easily strap and mount your device with ease on any trees. This product is fairly easy to operate as you just have to remove the SD card and insert it into a laptop for instance to view the captured pictures. Not only that, Reconyx’s trail camera comes with Buckview advanced software that will further assist you in handling the pictures. Operating on 12 AA batteries, this product has an excellent battery life and lasts for a long time so this product is highly recommended for hunters who plan to leave their device in remote areas for security purposes. The pictures captured are of high clarity and high resolution so you would get a clear picture and not miss any details in the picture. However, during the nights the pictures are a little grainy but so are most pictures captured by the trail cameras at night. Furthermore, the videos captured are also of excellent quality and clarity with an audio. This product has a fast trigger speed as it automatically captures roughly a picture per second if motion is detected by the camera. Not only that, the recovery time after the trigger is fairly good so it will get back into action a few seconds after the picture before is captured thus not missing out any important shots. In conclusion, choosing the best wireless trail camera is no easy decision. Important factors such as the clarity, setup, trigger speed, battery life and price should be taken into consideration. Therefore, I hope my review assists you in making the right decision. If you are interested for some rangefinder binoculars, please look at the post here. As for the binoculars which are at the cheaper side of the spectrum, you can check out here. If you are still not convinced whether you should get a binoculars or a spotting scope, you can read the article here. Here are tips to care for your binoculars too.